One big turkey. Why do you do things? Under a grey sky and through intermittent snow flurries, Charlie and I skinned up to and past the top of 25-Short, a 2,200-foot glade of pines on the Buck Mountain Massif. 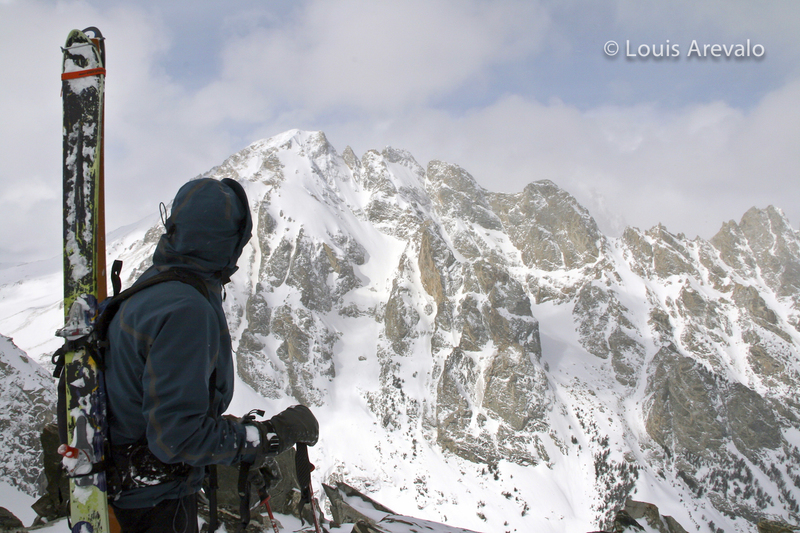 Our plan is to ski into the south fork of Avalanche Canyon via Turkey Chute then gain the east ridge of Mount Wister, 11,490 feet, skin to the summit, then drop down the north fork. Charlie drops into Turkey Chute. Charlie goes first pausing above a rollover then slices right and down to a corner and signals that he is safe. Spooning his tracks, I head toward the rollover struggling with the varied consistency of the snow. Instead of imitating his cut I make an aggressive hockey-stop at the crest of its steepness. My stomach goes sour. A glance uphill confirms that the surrounding snow is moving. As my legs are swept from under I initiate an abbreviated swim stroke. Arms paddling backwards, legs struggling against the anchors of my skis, the realization of danger causes time to slow down. In this acute moment several random thoughts pop into my head. Jacki, my wife, is going to be pissed. Is the snow in the Teton’s better than the snow in the Wasatch? Will I ever stop making mistakes? 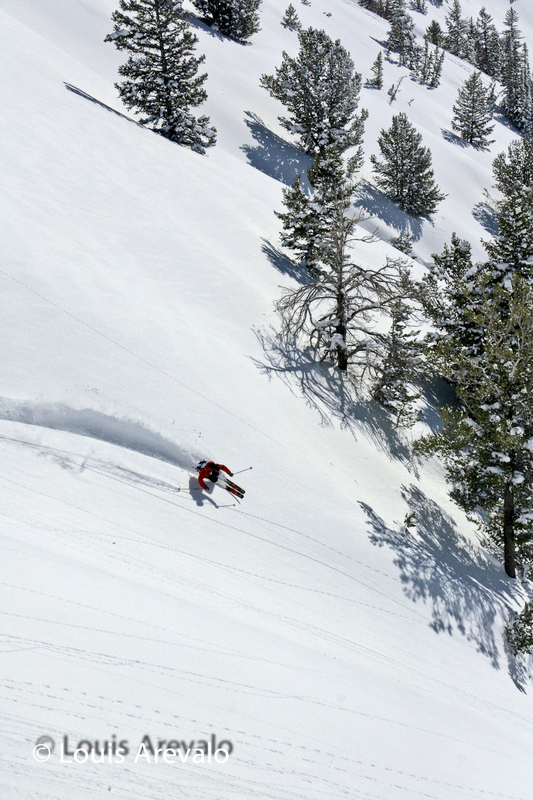 Is skiing in the backcountry worth the risk? Well Louie, that wasn’t the smartest thing you’ve ever done. Despite all of the days digging pits, fondling snow, kicking cornices, cutting slopes, negotiating terrain and witnessing slides, I had ignored the warnings. 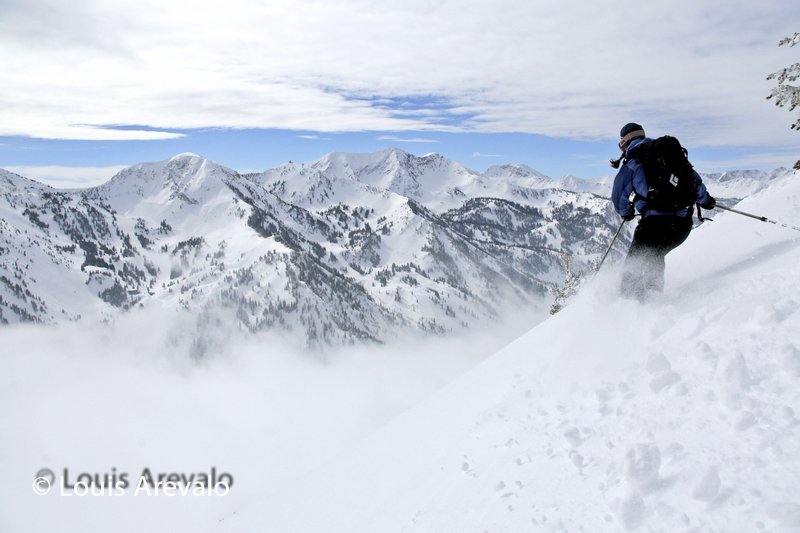 Today’s forecast called for possible slabs, sixteen inches deep, in wind-loaded terrain. While skinning out of the forest of pines the winds had been apparent, we could see snow loading in the chute and it was steep. To this point in the slide my reaction was not panic. I was more concerned with adjusting my turns to the heavy snow then about causing a slide. Everything behaved predictably and I deserved to go with it. Is my wife really going to be pissed? Yes, but only if I don’t come home. Three years ago Charlie, Anna and I tried to pull off another escapade in the Teton’s. Our plan, to cross Jackson Lake, set up camp then climb the ice formations in Waterfalls Canyon, was doomed from the word go. 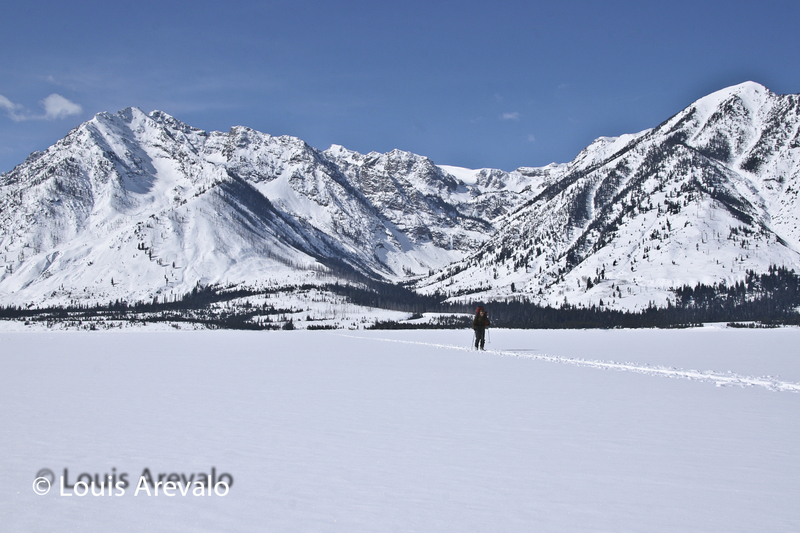 We arrived late to our launching point, wasted time rigging sleds, crossed the lake and set up camp during a bluebird day. Approaching the first waterfall the sun became oppressive. Wet avalanches on the south-facing walls began to release. Stopped at a point that would take us beneath a slope above the first waterfall, which led to the second, we evaluated our options. The terrain left of the waterfall was cliffs and to the right and above was a craggy outcropping of rock. The only path for us to cross was a small zone with potential for danger. The slides we had seen so far were small, but still large enough to take you for a ride. If one were to happen near the waterfall you could easily be swept over, the consequences being tragic. I didn’t like it. Charlie and Anna were more optimistic and continued without me. Anna went first and then after 50 yards Charlie followed. Not far into that zone snow poured off the crag above, crashed onto the slope and triggered a slide. I hollered, Charlie froze and Anna screamed for direction. The slide wasn’t fast, but there was no time to retreat. Snow fanned out, gained momentum and scooped Anna up. She fought to stay on her feet, but the heavy wave forced her back and when it stopped, only yards from Charlie, her legs and right arm were cemented in the debris. After Charlie helped extract Anna we retreated a safe distance down canyon to watch nature at work. That afternoon we counted over twenty slides. Today in Turkey Chute my white moving world stopped. The slide continued without me. It funneled and ran a few hundred feet more. Facing into the slope, legs buried to the thighs and left arm up to the bicep, I yelled to Charlie. You’re one lucky dog. Time to wake up! Is the snow in the Teton’s better than the Wasatch? Not a chance, but it’s good enough. We yo-yoed down the remainder of the chute. 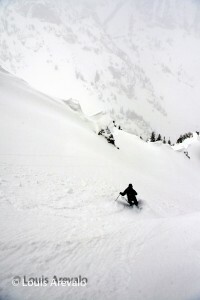 From its base we put in a track up Avalanche Canyon through shin-deep powder over a spongy base. Guessing, from within the roiling clouds and snow around us, at which south facing couloir would lead us to the east shoulder of Wister Peak, we skinned and booted 1500 feet up. Only slightly relieved to be traveling on a different aspect that wouldn’t be prone to slabs as deep as the one from earlier, I noted the wind, snow and occasional break in clouds that let in the heat of the March sun. I told myself to read the signs and make decisions constantly with regard to our immediate situation. The limited visibility to the surrounding grandeur of the Teton’s put my confidence low. 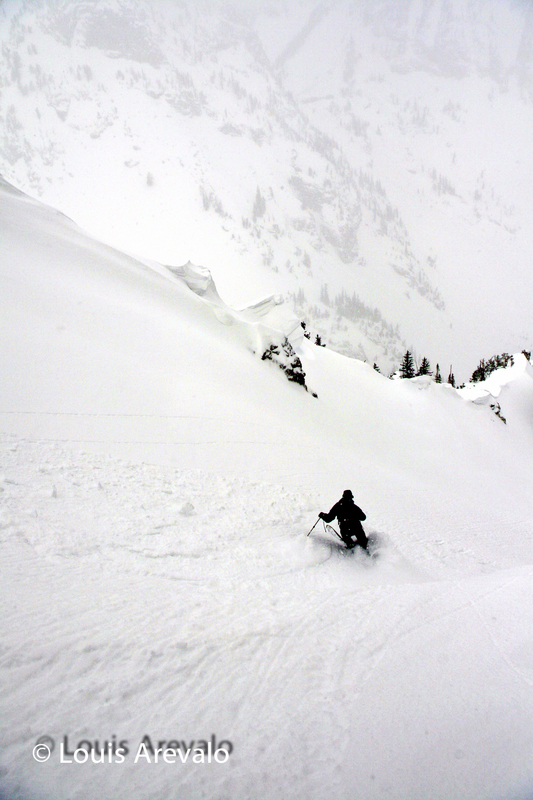 Skiing into the clouds, Jacki exits via the Little Cottonwood side. Making progress upward I recalled my first brush with a slide in the Wasatch Mountains. Years ago with a stable snow pack and after several laps in Cardiff Fork, we chose to exit south to Alta. The weather in the Big Cottonwood Canyon side had been calm and sunny with only a few clouds along the ridges, on the Little Cottonwood Canyon side we were greeted with localized snow flurries and erratic winds. Swirling clouds had our visibility jumping 2000 feet to the road to no more than ten feet in front of us. Suspecting there might be loading on the face I ski-cut the slope releasing a slab ten inches deep. Confident after skiing stable lines all day the angle of my line was low. The cracking snow grabbed the tails of my skis and forced me back. I tried to step out of the moving mass, but my feet went out from under. Luckily, that’s as far as I went. The crown was 70 feet wide and wrapped around the ridge crossing aspects. Through a window in the clouds we saw that the slide had swept the face, spread wider and stopped near the highway. Analyzing the incident at home I assumed the weather had been the same to the south as it had been on the north more sheltered side, then executed a slow ski-cut and underestimated the reaction it would produce. The slide easily could’ve taken me through trees, over rocky bluffs and by the end buried me. Up to this point in my experience I had set off several slides by cuts and cornice drops, but had always managed to feel safe. That day was a step backward. Today it seems as if I’ve started over. Taking in the view from the ridge. Arriving at the east ridge of Wister, Charlie and I discover an error in our navigation. We are one couloir to the east too many. An exposed ridge between the few hundred feet to the summit halts our progress. The clouds have thinned allowing views of Nez Perce, Cloudveil and South Teton. To the west Mt. Wister’s northeast side looks enticingly scary. 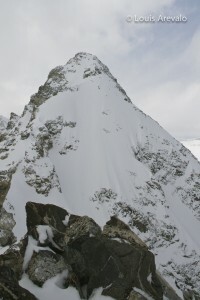 Even if we had climbed the correct couloir I’m not sure I would’ve skied it. Fresh snow, constant wind and a brush with a slide have me leaning toward self-preservation. Regardless, it’s breathtaking. Teton stone emerges from the pristine snow to illuminate future winter objectives. Wister is added to an ever-growing list of things to ski, but today is not the day. Will I ever stop making mistakes? Not likely, but I’d like to think that with every one of them I’m learning and getting closer to being that guy who is still getting out when he’s 80. On our way to the ridge we noted cracking in the snow. They were shallow and short, located in a flared section 300 feet below as well as in the final feet leading to the ridge. From a safe observation point on the ridge I watch Charlie cut the top 40 feet flushing a slab of snow down. It doesn’t run far and is not very wide. Charlie continues and takes refuge behind a buttress of rock. Wide awake, I follow his tracks then pass. I cut the flared section quickly and stop out of harms way. From the tracks a narrow soft slab releases, rapidly entrains more snow and runs its course 200 feet below. Not enough to bury a skier, but enough to knock you off your feet. Charlie passes safely, I wait for his signal then carve my way out of the chute and onto the lower angles below. Our failed attempt to ski Wister doesn’t feel bad after skiing safely from the couloir and into the hero snow of Avalanche Canyon. Is it worth the risk? 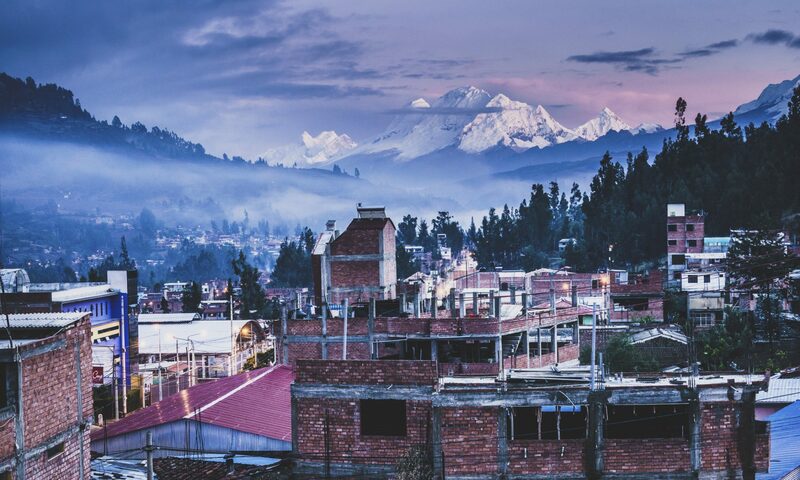 Is it worth seeing dramatic scenery of old and new places filled with snow? Or traveling among gnarled conifers that stand in contrast? What about wobbling in ski boots with the musty smell of lichen in the air as you transition from the forgiving snow to the alpine rock. How about feeling the sun warm your face after emerging from a shadowy climb? Is it worth failing to obtain your objective only to keep coming back for more? And what about the fresh snow under foot while gliding down long runs in chutes, on faces and through glades? Do these things equalize and balance the risk? The northeast aspect of Mt. Wister. I don’t know, but they make me happy.